On certain dates cruise ships come into the Homer harbor. 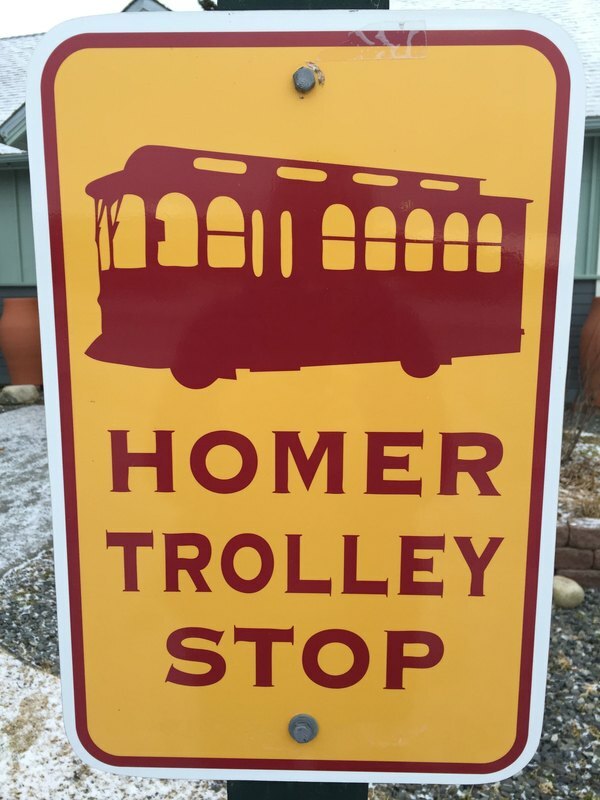 The trolley is used during those days to pick up people on the cruise ship to take into Homer. Though the route has been altered during these days compared to other days in order for the people on the cruise ship to use the trolley all are welcome. Take the free Spit shuttle bus which is on your left when you get off the dock from the Cruise ship. These buses leave every ten minutes going back and forth from the Salty Dawg and the ship. Purchase your Trolley ticket with cash($15 per person) from the Trolley agent located by Salty Dog drop off. They will be selling from 10-1, after that you may purchase a ticket from the trolley driver. Please know on Cruise ship days there is no group or family discounts available. The trolley route takes 1 hour to do as it is a trip to town and back. If you miss a departure enjoy the local shops and restaurants while waiting for the next pick up. Ocean Drive: Stars Coffee Visit the breweries( Homer Brewery and Grace Ridge Brewery) and places to eat, along with fun outdoor gear stores. It is also an easy walk to the airport from there. Juicy Bus/Wildberry Emporium: A great stop to enjoy the art and gift shops in Homer. See the Homer bookstore with local authors before heading to one of the two local coffee roasters where internet is available. Enjoy a gentle stroll down Pioneer Avenue or get back on the bus and enjoy the ride. Lands End: End of the Spit and has a great beach. Easy walk back to the Salty Dawg. You will find this sign that you see below all around the town of Homer. It is at these areas that the trolley will come to pick you up.